100% Free! Supports Android 2.3 and up! Location, Photos, Notes, Colors, Blood and Mucus Content, Prior Discomfort, Urgency Level and Pain Level, Medication, Evacuation Completeness, Headache, Nausea, Fever, Backache, Cramps, Corn & More! Review your PoopLog history as an expandable list, separated by month; or display each entry directly on a calendar! Map view coming soon! On large screens, your entry details will be displayed alongside your history! Pie charts, Bar charts, Scatter charts, Averages, and Totals. 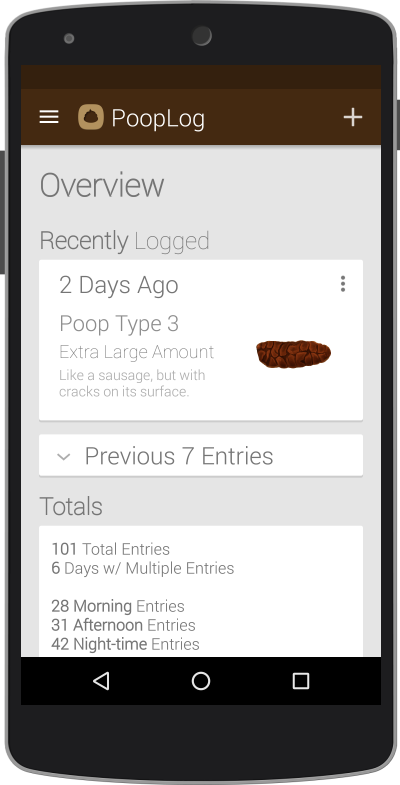 PoopLog empowers you to know more about your bowel health, inside and out! Create, Save, and Share customized reports for anyone to review. Choose between an easy-to-read plain-text report, a rich-text report with embedded photos, or a CSV report which unleashes your data, making it available to import into any spreadsheet or charting app for further analysis. Every PoopLog entry is viewable as a rich, detailed view. On large screens and tablets, your details will be displayed in a secondary pane alongside your Overview or History views. When you share any PoopLog entry, you can choose to share only a few, or all of the options attached to that entry (location, note and photo only for example). Why develop PoopLog? Is it a joke application? 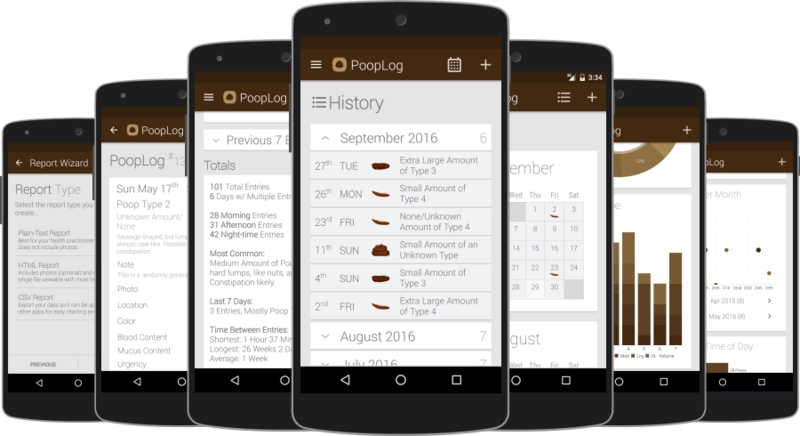 As silly as it is, I developed the original version of PoopLog out of an actual need to track my bowel movements. I suffer from a stomach-related illness and years ago my doctor requested that I track my bowel movements based on the Bristol Stool Scale. At first, I started tracking it on paper, and then on a spreadsheet. I quickly realized my Android phone would be the most convenient tracker, since I often use it on the toilet. I wrote and released the very first version of PoopLog for Android in July 2010, and continued to update it for about a year, until other projects took my focus. As the Android OS matured, I decided to sketch out what a redesigned PoopLog would look like, including many of the features requested by my users. I worked a few hours every week over the past few years to develop this latest jam-packed update, and I hope that you find PoopLog useful and fun, as silly as it may be. I can really attach my location/photo to my PoopLog? Why? These weren't original features of PoopLog. For some reason, these were the most requested features from my users so I had no choice but to include them! Photos are stored to your internal storage in the /PoopLog/Photos/ folder. You can choose to hide or show PoopLog photos in your device's gallery; this option is configurable through the PoopLog application settings (Settings > Privacy) and the default is to hide any photos taken. While most versions of Android observe this setting and will ignore scanning your photos for the gallery, some versions of Android operate in a non-standard way and will scan everything, regardless of this setting; It has been reported that many Android 4.0 devices suffer from this unfortunate inconsistency. Location is only available to devices with Google Play Services (for now) and requires Android 3.0 or later. Why does PoopLog require install permissions? This permission is required if you wish to add your location to an entry. Your location is never transmitted outside of the app as part of any analytics and no location information is ever transmitted out from your device to anyone, ever, unless you select the share option for a PoopLog entry or report. This permission is required if you wish to save photos with entries, or if you wish to save a created report, or if you wish to restore or backup your entries. The only non-system folders PoopLog ever looks at are /PoopLog/Photos/ , /PoopLog/Reports/ , & /PoopLog/Backups/ . This permission is required as part of the Google Play Services, which is used to obtain your location. PoopLog must check your Google Configuration to see if you have a compatible version of Google Play Services installed in order to obtain your location. This permission is primarily required to obtain maps from Google whenever you choose to add and display your location to an entry. In addition, if you choose to opt-in to analytics, PoopLog will transmit non-identifiable usage data which will help the developer, Kevin, know which PoopLog features are most popular and require further development. The information collected will never contain or pertain to any of your entries, and will only transmit what sections of the app you navigate to. By design, PoopLog user data will never be transmitted outside of the app, unless an entry or report is directly shared. Why can't I share my PoopLog directly to [insert any app here] ? Some apps contain a flaw where it believes you are attempting to share a link, rather than share text. If you are having an issue with a particular app, feel free to email me. and I'll see what I can do to support it! What features can be expected in future versions of PoopLog? The update to version 2.5 took me over 3 years to complete , and I still have more ideas. Most immediately, a Map History View will display your PoopLog entry locations around the world, or just around your town. Soon after that, I plan on adding the ability to store PoopLog data for multiple people/pets in the same app! If you have any suggestions, comments, ideas, or any feedback at all, email me at feedback@kefsco.com. Sorry, no. Maybe one day. Will PoopLog ever be an iPhone/iPad/iOS app? bugfix: fixed crash when attaching location on devices set to a non-english locale. Thank you for submitting the crash reports! bugfix: fixed crash when opening Settings > Default Options to Display on some devices. Thank you for the bug reports! This release took me 3+ years to complete, working a few hours every week. Most of the features are new to this version. trends *new! *: by popular request, this page is available from the navigation drawer; once enough data is logged, trends will be represeted by 7 different graphs: totals by type & volume (pie charts), totals by type stacked by volume & totals by volume stacked by type (stacked bar charts), month over month for type by day & volume by day (scatter charts, modifiable months), totals by time of day (horizontal bar chart); press the volume down key on this screen to activate the material color charts easter egg; you can activate and spin the pie charts here for fun; until enough data is logged, example data will be displayed. initial release and publication to the android market!!! view log works, but is useless. next version to have updated view log. pooplog.xyz is created with ♥ by Kevin, in Victoria, BC. Feel free to use any or all of the code. If you have any suggestions, comments, ideas, or any feedback at all, please email feedback@kefsco.com.